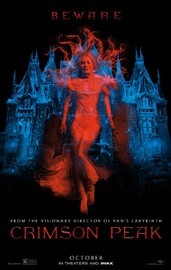 Guillermo del Toro’s ode to Gothic literature begins with one of those typically useless warnings: “Beware Crimson Peak!” Not something actionable like, “Don’t trust Thomas Sharpe and his sister” or “Stay away from Allerdale Hall if you value your life.” No: “Beware Crimson Peak,” delivered to a terrified little girl by her dead mother’s frightful apparition. The warning isn’t without purpose. It’s a lazy trick to set an ominous mood for audiences – without ending the story before it begins. After all, a practical warning would mean that the film’s plucky heroine, Edith Cushing (Mia Wasikowska), never would marry Sir Thomas Sharpe (Tom Hiddleston) and never go to Allerdale Hall to experience the horror, the horror!